Help CHANGE the lives of our troops and and law enforcement by participating in #ALittleGoesALongWay campaign in our attempt to set a new World Record for the most loose change (pennies, dimes, quarters, etc.) donated to charity. The proceeds from this campaign will benefit not just Veterans but law enforcement by helping Police Officers cover travel expenses so they can visit the funerals of their fallen brothers. HOW IT WORKS: Operation Once in a Lifetime has businesses across America collecting loose change that you can drop off during their business hours. 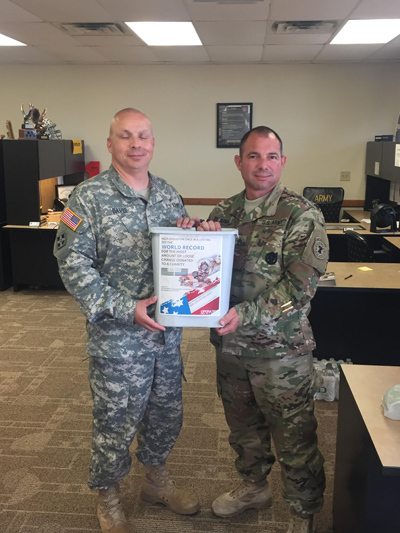 Our largest collection point will be the Support Your Troops Resale Center located at 221 W Parker Rd #560 Plano Texas 75023. These businesses will be collecting loose change until September 11, 2016 when they will cash in the collected coins and report the amounts raised to Operation Once in a Lifetime. To find the location nearest you, follow this link. If you are not near one of these locations and still want to participate or become a collection center you can email staff@operationonceinalifetime.com for details. LAST DAY: Operation Once in a Lifetime is wanting to turn in all the donated change on September 1, 2016 and will provide the record breaking attempt September 11th. WHAT IF I JUST WANT TO DONATE: If you want to just make a tax deductible donation you can visit our Current Needs page and refer to “Current Need One” to make your tax deductible donation towards helping our troops and law enforcement.